There was a very strong demand for Hungary’s T-bonds on yesterday’s auction and this prompted the State Debt Management Agency to increase the issuance. At the same time the bond yields were three to twelve basis points lower than at the previous auction held a fortnight ago. Hungary’s construction industry output showed a whopping 28.3% year-on-year growth in February. The industrial output was 8.1% higher in February than a year earlier. The month-on-month growth was 1.6%. The gross average monthly wages in Hungary were 1.7% higher in February than a year earlier. Excluding those employed in public work programmes , the figure shows an increase of 6.9 percents! The monthly gross wages averaged HUF 240,000 per month, 5.2% up year-on-year, in the private sector alone. 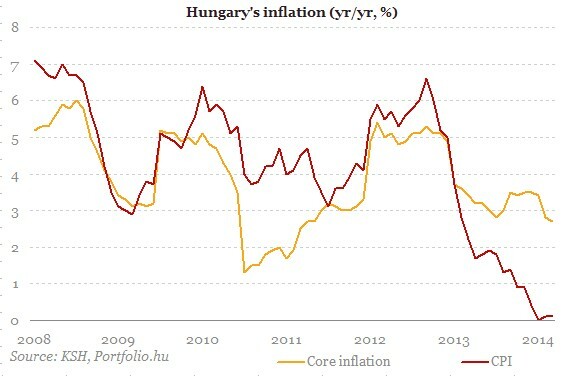 Hungary’s inflation was flat at 0.1% year-on-year in March and it’s yet another “surprise to the downside”. The “market’s call” was for a 0.3% CPI. Core inflation measures declined again which confirms the absence of underlying price pressures. The central bank continued with their cutting the base rate which is at a historic low of 2.6% now. Let’s note that the base rate was 7% when Hungary could get rid of bank chairman András Simor, a neoliberal/postcommunist stooge of the IMF. BTW, Hungary’s international reserves jumped to a new 2.5-year high at 36196.70 EUR millions. Hungary’s balance of trade surplus jumped to EUR 766 million in February from EUR 482 m in January. The surplus was EUR 118 million higher in annual terms than a year before. Exports and imports (in EUR) increased by 5.0% and 3.5%, respectively in February, 2014 compared to the February of 2013. By December 2013 – February 2014, the number of unemployed people decreased by 123 thousand to 379 thousand over one year, and the unemployment rate diminished by 3.0 percentage points to 8.6%. Employment in Hungary is at an all time high. The number of employed people was 4,053 thousands in February which is 236 thousand more than a year ago. The employment rate of people aged 15-64 increased to 60.4%. Why would Hungarians support a party and a prime minister that legislate policies that hurt their weak economy ? I think the above economic figures themselves give a good answer . Though I doubt very much indeed that the author(s) of the Jerusalem Post editorial wouldn’t have known these facts otherwise.